I long ago proved to myself that reading everything in the world, was impossible. I couldn’t even get through the Science Fiction shelves of my 9th grade library. That doesn’t stop the wish from surfacing periodically, however. This year, it has been to immerse myself in all the literature from the Middle East! That includes not just Arabic, but Persian, Turkish and the salt and pepper (or maybe za’atar and baharat) of many other languages. Kurdish for example has a continuum of dialects, two of which have had major 20th century efforts to stabilize them, and produce literary works. I began the long journey, as they say, with the first step, last fall, watching movies from Iran, listening to Coleman Barks’ wonderful translation and vocal rendering of the great Sufi poet Rumi. I finished the first volume of Abdelrahman Munif’s marvelous trilogy, Cities of Salt and had the second, The Trench, only two books deep on my Read-Next! pile. I was impressed with the City Lights edition of I’jaam, a novel of life in Sadaam Hussein’s Iraq by the Iraqi writer — since moved to the US– Sinon Antoon. I had discovered and lined up at the library writers from Iraq and Iran and was ready to go. Then came January and the stunning popular uprisings in Tunis and Egypt — now in full flow in Bahrain, Yemen, Libya and re-surfacing after brutal repression in Iran. How to get to know, just a little better, the context of these brave young people? We know so little. Some of us have met immigrants, often in the technical fields, from all over the Middle – East; we may even count a few as friends. We may have visited Egypt, or Morocco, perhaps Istanbul in our travels but most often our knowledge comes from the latest news which is, by definition, BAD. Surely there is much more. Where to start getting to know them? Some might choose history or sociology; some might start with recipe books! There are plenty of English language newspapers from Egypt which, besides daily news, have features and other indicators of life lived, at least by the middle classes and above. Egypt has a least one magazine in English. Libya can’t count so many resources in English, nor Yemen though it is surprising what does exist. For this we turn to editors or readers who have spent some years with such fiction. Help me! One good place to begin is with Tablet & Pen: Literary Landscapes of the Middle East. The editor is Reza Aslan, an Iranian, since immigrated to the US. With a copyright of 2011 it is recently published and with over 600 pages an impressive effort. I heard of it prior to the holiday season and gave it to a few friends, as well as to myself. It really is quite wonderful, starting with “The Renaissance of Arabic Literature, 1910-1920 and ending with what he calls “The Globalization of Middle-East Literature 1980-2010.” The selections are substantial both in length, and reputation of the authors. 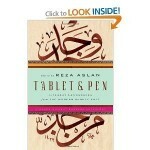 It is wide ranging, including Turkish and Pakistan Urdu, as well Arabic from Egypt, Iraq, Jordan and other countries. It includes both poetry and fiction. Zayd Mutee’ Dammaj, from Yemen (1943-2000) is one of those included. Although he comes from a political background the short piece in the volume is not so. Titled “A Woman,” the story is that no matter what market the narrator goes to, to escape a vision of a certain woman, she appears — to both entice him, and reject him. I fled from her further still, to Bab al-Qa. There the bur’i seller and his wife, who made the zalabia, weren’t in separate shops but on the same corner, working and selling together in the same narrow alley. And no sooner had I begun sipping my bur’i than I found her in front of me, eating her zalabia pastry as usual. So back I went to Bab al-Sibah, meaning to tell her frankly of my feelings towards her. But I couldn’t pluck up the courage. She’d leave the eating place while I stood sipping my hot bur’i, drinking in her whole body, imagining the things she must have experienced the night before. And I thought how she’d constantly jostle against God’s creatures as she left the eating place, till she reached the place where I was standing, then how she’d push me away with a motion that wasn’t, I felt, meant to entice me. This repeated itself a hundred times, a thousand times, for a lifetime, and over ages and all eternity. It’s still repeating itself. Do not cry over me. I said do not cry. and no waves without a shore where they crash. to have reached the last shore. Even the sound of my breathing cannot reach me…. It’s a terrific book to have, at least in a local library and as good a place as any to start a general exploration of the region. For my purposes, however, of understanding something of the young in open revolt, it is both too historical, and not narrow enough. I’ll have to wait a bit to look at the Punjabi, the Turkish and even the generous selection of Persian [18 of the 68 selections.] Egypt is represented by only 4, Yemen by 1. Of the other 2011 risings – nothing. Iraq has 4. I want to know what the young writers are saying. Or, actually, what the young readers are reading. That might include the classics of Naguib Mahfouz or Tawfiq al-Hakim, but surely would include newer and younger authors, occupied with life experiences and decisions similar to the protestors. The Anchor Book of Modern Arabic Fiction appeared in several listings of Arab literature in English translation. It has a 7 page table of contents including 79 authors from 14 countries. The editor, Denys Johnson-Davies has been praised by Edward Said as one of the best Arabic language translators into English. The copyright of 2006 is by the American University in Cairo — which has its own very well thought of press, and presumably worked with Johnson-Davies. It’s a very impressively put together volume. Though, as Aslan, from Iran, weights his book with Persian, so this one, from Cairo, weights in favor of Egypt with 38 of the 79 authors included. That may be an over representation in the book, though not, perhaps, of Egypt’s contribution to the Arabic reading world. As Taha Hussein, a well known Egyptian writer, once said — “Egyptians write, Lebanese publish and Iraqis read.” [For an interesting side note on literature sales, go here.] Nor is it perhaps, overbalanced for our wanting to know about the Egyptians who threw out Mubarak in 17 days. As I read through the selections, giving them grades of 1-5, many were 4s and 5s. Of note was a selection of Ala Al-Aswany’s 2002 The Yacoubian Building, from which a good movie has also been made. The building, like Katherine Anne Porter’s Ship of Fools, is used as means to follow the intersecting lives of several of the residents, including a young woman being schooled by her mother and neighbor how to allow enough, but not too many, sexual liberties to keep a job, a homosexual who trades fine living for sexual favors, a poor fellow who moves into radical Islam. The commentary on Egypt is caustic, and somewhat mournful. How do the old and the new cohabitate? During that year Busayna learned a lot. She discovered for example that her beautiful and provocative body, her wide, dark brown eyes and full lips, her voluptuous breasts and tremulous rounded backside with its soft buttocks, all had an important role to play in her dealings with people. Haggag Hassan Oddoul, of Nubian origin in the south of Egypt, has a wonderful excerpt from his collection of short stories, Nights of Musk. Here, the young men are singing to the young women seated across the way. The wide sleeves of our galabiyas hung calmly, relaxing with the long sweet vowel, as it took away the heat from our loins and soothed our passion. And with the final m the hands fell quickly down to show how much, how much we enjoyed the song. We captured your hearts, and they poured forth a flood of potent giving. Your bodies swayed from side to side, and you clapped your henna-dyed hands to the rhythm of the tambourine’s beat. We communicated, and in spite of the sandy distance between the doum and the sycamore, we were one harmonious group, swimming altogether through the heaving sea of the night. We dissolved, sparkling with burning desire and an ardent longing to be lawfully joined on a day we prayed would come soon. Our grandmothers sat close by. They saw our shapes clearly and smiled. They whispered of their own days that had passed like a sweet dream whose moon has evaporated behind a single sunny day. She pictures to herself the scene in the lanes of the village: her daughter riding on a donkey, her face spattered with black and the children screaming behind her and the women throwing stones at her from behind doors until at evening she reaches the house she left to the sounds of drums and pipes. I bid her farewell with her mother and go off on my own to bring the medicine for maidens whose virginity has been taken. Then I enter with her into her new home and I set down on the run. We look at the bridegroom who’s being made a fool of — poor fellow! Generally he is more frightened than the girl. I let out a trilling cry of joy as he steps across the threshold, and another one when, as agreed, the bride lets out a cry when the bogus blood flows down between her thights, and yet another one as he throws us the ‘gown of chastity’ and the women gathered in front of the door begin to dance. They grab hold of the gown drenched in blood and dance in the courtyard of the house, and the bride’s mother cries with joy and guns boom out from the rooftops. I take hold of the other hundred francs and shove them into the box. This is a volume well worth having. Virtually all of the excerpts come from books available in English. Dates of birth and countries of origin are given to help focus a bit more on those you might be most interested in. The main drawback comes directly from the choice to include so many selections: they are also, generally, very short. Two pages is not enough to decide whether we want to read a whole novel. I learned a lot, have added some names to a to-be-read list, but think perhaps a series of anthologies with longer portions, and fewer writers — perhaps divided out by age/generation, or regions would have been good. The third anthology, called Beirut 39: New Writing from the Arab World is easily the most generous to younger writers. As the title implies, 39 are included, all under the age of 40. And, as with the other two books, the origin of the editing provides the bias — here Lebanon, tied with Egypt at 8 contributions each. Tunisia and Yemen have 1 each, as does Libya. Because there are fewer writers, each has a few more pages than in The Anchor Book, an approach that suits me. In fact, I’d like to see complete short stories, which I’ve since discovered in several volumes. Beirut 39 also includes a few poems, including this sly take on a cemetery by Ahmad Yamani of Egypt and Spain. What is interesting about this collection is that the editors and, it seems, the writers themselves recognize similarities across national borders, and bonding through youth and against conservative age. What brings together most young Arab writers is their tone of protest, and their rebellion against traditional literary culture. They have announced their disobedience against the ideological bent that exhausted Arabic literature during the 1960s and 1970s. They have also risen above the idea of commitment so prominent a few decades ago, which was imposed by a political party and communal way of thinking. Instead, they strive towards individualism, focusing on the individual, the human being living and struggling and dreaming and aiming for absolute freedom. Many young writers have declared their disdain for what they describe as contrived, ‘proper’ language. Often, they aim to express their personal concerns as they see fit, freely and announce their frustration with language itself. … they want to write as they speak, absolutely spontaneously, unbounded by the censorship imposed upon them firstly by the language itself, and then by religious or moral apparatuses. It isn’t a far leap to see a parallel to the spontaneity insisted upon by the Beat writers in the U.S. and the youth revolution that followed…. So, there is a good deal to be discovered in all of these books, and others I’ve run across. Johnson-Davies is himself doing a mammoth effort in making available work from many Arabic speaking countries, including several volumes of short stories, here (1994) and here (2004) just for starters. I’ve been introduced to whole new ways of perceiving and acting in the world through these readings, and won’t be stopping soon. A few of the authors have caught my attention and I’d like to know them at more length, as well as continuing to look for whatever the literary portion of the zeitgeist is that’s powering the changes we are witnessing from afar. Banipal is an English language journal of modern Arabic writing, co-founded by Samuel Shimon, an Iraqi, who edited the Beirut 39 volume, above. It would be a great place to stay attentive to what is going on. 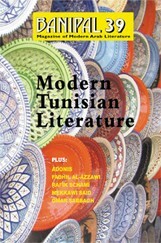 The current issue, for example, is devoted to Tunisian writers.